The main selling point of this malaria-free reserve, set within a collapsed volcanic crater two hours drive northwest of Johannesburg, is its proximity to South Africa’s largest city and most important international transport hub. I have never found it quite so compelling as the Kruger, simply because it is a lot smaller, and the wilderness feel is undermined by its proximity to the glitzy Sun City casino and resort. However, the game viewing can be superb, with all the Big Five present, and I’ve found it to be one of the best places anywhere in the country for close-up encounters with white rhino and elephant. It is also a great birdwatching destination, with a total checklist of 350 bird species that includes localised gems such as crimson-breasted shrike, violet-eared waxbill, shaft-tailed whydah and pied babbler, and a high chance of ticking 100-plus species over a two-day stay. A highlights is the organised night drives, undertaken in open 4x4s, which offer a good chance of encountering nocturnal specials such as brown hyena, aardwolf, genet and leopard. Close to Sun City, Pilanesberg National Park is often unkindly regarded as the “poor-man’s Kruger”. While it is certainly smaller – and hence prone to traffic jams – the park does host just about every mammal of southern Africa, including the Big Five. Also unlike Kruger, it is free from malaria. 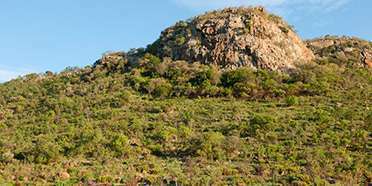 Encircled by three rings of volcanic hill and located within a transition zone between the dry Kalahari and wetter bushveld, the 50000-hectre park offers a combination of habitats from open grasslands and hilly slopes to wooded gorges and rocky outcrops. On my last trip we saw several elephants, along with two white rhino mothers and their young, giraffes, zebras, wildebeest, waterbuck, hartebeest, springbok and numerous other smaller species of mammals. Though, sadly the lions eluded us. The park’s relative proximity to Sun City and Johannesburg means it is popular with day-trippers – there’s no avoiding that. Personally I’ve found that it’s best to plan your game viewing early in the morning as once you get through the gate the bottleneck does dissipate more quickly and by late afternoon the park is jam-packed. Pilanesberg is instantly likeable, and with its savannah grasslands surrounded by an attractive ring of hills broken by wooded valleys, it’s hard to imagine that it started life as manmade reserve (it opened in the 1970s as an accompaniment to neighbouring Sun City). While I think it lacks any kind of wild atmosphere – the rangers know where most of the animals are located at any given time, ‘extras’ include game checklists given out at the gates, and the lodges are unashamedly touristy, facilities are very good and game-viewing is easy if you’re short of time. I saw the Big Five here in just a two-day visit, and even on a short two-hour safari from Sun City, the chances of seeing some of the larger mammals is excellent. Bordering the Sun City casino complex, Pilanesberg is not exactly an untamed wilderness where only lions dare tread. No, this 550-sq-km reserve, with its good network of tarred and gravel roads, was designed to offer a manageable slice of African bush to local city folk. However, I enjoyed touring this extinct volcano crater in the Pilanesberg Mountains; it was possible to lose the other cars and get closer to nature, I found, by hitting the gravel roads. The reserve hosts all the Big Five and I had many animal encounters and sightings. Sitting in one of the many hides, watching rhinos and lions battle for supremacy of a waterhole, was particularly memorable. The crowd of excited Jo'burgers added some incidental comedy. If you have a few days available, Kruger National Park or nearby Madikwe Game Reserve is a better option than Pilanesberg. For families or people with little time, however, Pilanesberg is worth considering, offering accommodation in both exclusive and family-friends lodges. Wild dogs are extremely rare in Africa. These fascinating matriarchal hunting dogs can be seen in few places, and Pilanesberg, in the north of South Africa, is one of them. Extinct volcanic craters and rocky outcroppings make up the landscape in one of the country’s largest parks. I was amazed at the variety of wildlife here and spotted many antelope not seen in other parks - such as eland, sable and gemsbok. But you’ll also find the Big 5, and most predators including cheetahs. It’s the wild dogs though that make this place special. Also called painted dogs, these slimline, big-eared hunting machines stalk their prey in packs and are sensitive, intelligent creatures often shot by farmers for poaching livestock. The ghastly Sun City is close by, but don’t let that put you off, this is one of South Africa’s best parks. Pilanesberg is an odd park. Like most of its visitors, the first time I went there, I daytripped from Sun City, which stands right next door and it feels a little like an outing to a giant safari park, coming from all the artificial glitz of the giant casino complex. The fact that this was a constructed game reserve makes the comparison even more apt. But it really doesn’t Pilanesberg justice. 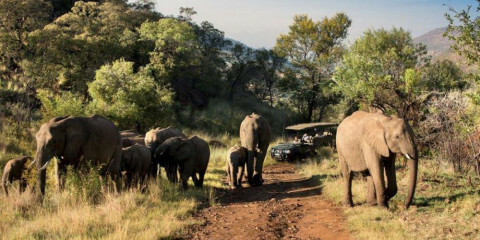 Only 2 hours northwest of Johannesburg and fabulously malaria-free, Pilanesberg is one of the largest game reserves in South Africa, covering 580 sq kms (224 sq miles). Plans are underway to create a 10 kms (6 mile) game corridor and link it to nearby Madikwe, massively enlarging the conservation area. It’s stunning scenically, set in a 1200 million year old volcanic crater, ringed by three ranges of hills. Near the centre of the park are Lake Mankwe and Thabayadiotso, ‘the Proud Mountain’. Once used as farmland, it was restocked as a game reserve from 1979 onwards with over 6,000 animals being translocated in Operation Genesis, the largest such undertaking in South African history. Today, it is a thriving Big Five reserve with 61 species of mammal including rare species such as black rhino, sable antelope and brown hyena, and over 300 species of bird. There are a couple of excellent lodges within the park – and of course Sun City on the doorstep. It’s also one of the few places in South Africa where you can go hot air ballooning over a game park, a truly magical experience. You will certainly see plenty game at Pilanesberg. I saw four of the Big Five on my first afternoon drive, and later that evening notched my fifth – a leopard – from the floodlit waterhole at Kwa Maritane resort. 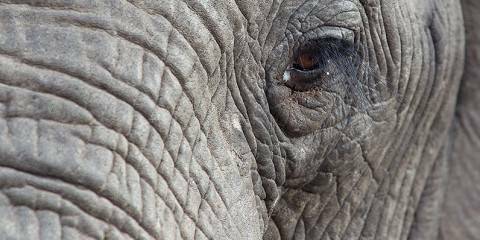 Indeed, virtually every southern Africa large mammal species occur here. This is largely the result of Operation Genesis, one of Africa’s most ambitious conservation projects, in which game of all kinds was translocated to this 55,000ha reserve, created on rehabilitated ranchland within the crater walls of an immense extinct volcano. The rich variety of birds – some 350 species – reflects the meeting of two biomes: the western Kalahari and the eastern lowveld. Some may feel that the slightly contrived history of this park, plus its proximity to the brash Sun City and other resorts, somewhat undermines the sense of genuine wild Africa. Nonetheless it offers an excellent wildlife experience in an undeniably spectacular setting and, being just two hours’ drive from Johannesburg, is extremely convenient for the safari-goer who can’t reach the Kruger. Don’t be fooled by Pilanesberg’s proximity to the famously tacky mega-casino at Sun City – this park is actually extensive, scenic and biologically diverse, and well worth it as an add-on to the wave pool or gaming tables. I love the park’s towering volcanic outcrops, which give photos a great scenic backdrop. You’ll need at least a full day to do justice to the variety of landscapes here, and it’s easy to self-drive on the well-maintained network of roads. The park was stocked with translocated game in the 1970s and has a good variety of species including both white and black rhinos. If you’d like to stay the night (I recommend you do, to take advantage of the early mornings for game drives) there are a few good-value lodges to choose from. This scenic little park is set within the crater of an extinct volcano. For purists like me, it might feel a little bit contrived. All animals in the park have been reintroduced here. Some of the species would have occurred here naturally before they became extinct, but others wouldn’t. So, I can’t help feeling there is a bit of a zoo element to the place. Having said that, I was very impressed with the wildlife densities on my last visit. I had visited the park several times more than 10 years ago and I don’t remember the game viewing to be nearly as good as it was on my visit a few months ago. I saw lots of elephants, several white rhinos, lions, lots of zebras and wildebeest and several antelope species including some that feel out of place like the dry-country gemsbok and springbok. Pilanesberg National Park was my first safari destination in South Africa and it certainly delivered the goods in terms of wildlife. We saw all of the Big 5 over the course of three days in the rainy season (when the high grass and denser vegetation makes game harder to spot). Then to cap it all off, just as the sun was setting on our final day we found a pack of wild dogs on a recent kill near the exit. Pilanesberg’s density of game is certainly its biggest selling-point. But it’s also a very accessible park. It’s relatively small, you can self-drive, and most of it can be accessed without a 4x4 over the course of a single day if you’re in a hurry. It’s also just an easy couple of hours drive from Johannesburg and a little less from Pretoria. And it’s malaria-free. Combine all of the above with a handful of very affordable (if a little tacky) accommodation options and it’s not hard to see why Pilanesberg is a local favourite, particularly with families getting out of the city for a weekend or over the school holidays. During these peak periods, the park can get exceptionally busy and begin to feel a little like a big zoo, but come during the week out of season and you’ll still get some semblance of “real” African bush. There's something deliciously rewarding about a self-drive safari. Sure, your vantage point might not be as great from your rental car and you probably don't have the knowledge of a trained wildlife guide, but there's no feeling quite like seeking and finding wild animals by yourself. The Pilanesberg is sometimes criticised for being 'zoo-like', perhaps for its proximity to Johannesburg, its popularity as a self-drive park or for its near-guaranteed sightings (there's a great deal of wildlife in a comparatively small area), but the animals that wander here – including the Big Five – are 100% wild and free-roaming. Both black and white rhino inhabit this volcanic crater and it was here that I had my first ever rhino sighting, a magical moment where I switched off my tiny hire car's engine to listen to the mother munching noisily while her baby played nearby. The Pilanesberg is certainly not everyone’s cup of tea … After-all late night carousing seldom goes hand-in-hand with early morning game drives, but there are some who love it. Obviously, visitors have the choice of skipping Sun City’s casinos all together to rather concentrate on the wildlife that resides within the rings of hills that naturally contain this small park. I must be honest and say that this place is not my favourite park in South Africa by a long shot, but I still have enjoyed many good sighting here. From elephants and rhinos to lions and even a leopard killing a young kudu at the resort waterhole! The Pilanesberg is a small man-made reserve that has been extensively restocked, so while it lacks the wilderness vibe, it usually delivers quite consistent and decent wildlife sighting. If you like the sound of a bright lights and big city atmosphere combined with lots of animals and a late night game of black jack, then this park was made for you! Pilanesberg is so easily reached that my first experience of the park was the antithesis of everything I love about the African wild – paved roads, traffic jams, and tour guides with loud microphones. The fact that there were rhinos, both black and white, in numbers, lions, elephants, wild dogs and rumours of leopards and buffaloes seemed, at the time, incidental. But then I took my own vehicle, left the main roads behind and there I found a different park of beautiful rolling hills, pretty waterholes and wildlife undisturbed by the clamour two valleys away. A brown hyena, companionable rhinos, great birding and a wilderness experience that couldn’t have been more different than the busyness of the previous afternoon – these were Pilanesberg’s true gifts. If you’ve never been on safari before, Pilanesberg is a good way to check off some species. 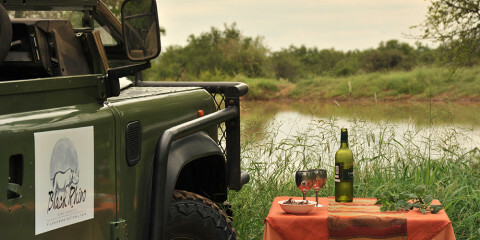 But if you get away, on your own, you’ll understand better what a safari ought to truly be about.